Spring bulletin boards can be lots of fun to create. Spring ideas could entail turning the bulletin board within the workspace into a spring field. Artificial or even real grass can be used for lining the bottom of your board. For a fun aspect to the bulletin board ideas for spring, a clothes line can be constructed that sits within the grass. Clothes pins can be attached to hang pictures or notes on the clothes line. Cutout flowers can be put all around the border. Clouds and raindrops can be created out of construction paper. 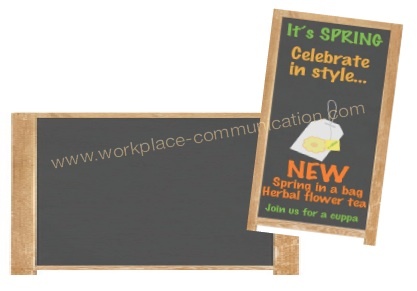 Employees can be part of the bulletin board ideas for the workforce space to help in creating a fun springtime atmosphere. Supplies needed - In any office there is going to be a need for paper clips, staplers , and plain sheets. A separate bulletin saying ‘I am in need of this' can be used. This is an efficient method to know who needs what, and managing how much of the office supplies are going to be needed is easier. Get to know each other - Improving the familiarity everyone has with their colleagues helps in better employee relationship. Just take a few employees on a monthly basis and display their picture along with the name and a few questions prepared by you as to how best you can describe him/her. This helps bring about a sense of familiarity among the employees. Topics - Some topic of the week or day could be picked up in advance. Interested employees could bring out their ideas and pin them on the bulletin board themselves. This serves as a great information exchange medium. As the number of people peering in onto the notice board is higher than an email sent to a group only, the employees gather information related to their field effectively. Motivation - Some motivational phrases can be pasted on a daily basis, with the need for the hour. Just reading these phrases when they enter the office premises will bring them into a better mood to work and also bring about a positive attitude in the workplace. Keep changing the phrases! This keeps everyone interested as to what will come next. Make it colorful - A dull board never is worth a look for the busy passerby. So, try to add colors! Bright ones are a sure eye catcher. Try to add pleasing effects which are professional like marked outlines on papers. No frills, please! Also bold out the writings so that they can be read easily.